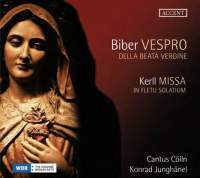 Heinrich Ignaz Franz Biber (1644‑1704) ‑he of the 'Mystery' or 'Rosary' Sonatas fame ‑ is very much the headline figure here, his name and his Vespro della Beata Vergine of 1693 clearly the principal work on this beautifully packaged and presented disc on the Belgian Accent label. On closer inspection, however, it is the lesser‑known figure of Johann Caspar Kerll (1627‑93) whose music dominates, for not only is he represented in his own right as the composer of the astonishing, truly remarkable Missa infletu solarium obsidionis Viennensis of 1689 but his music is interwoven with Biber's to form the Vespro della Beata Vergine. Both composers have a very distinctive style, but on this disc it is Kerll's music which creates by far and away the most powerful impression. 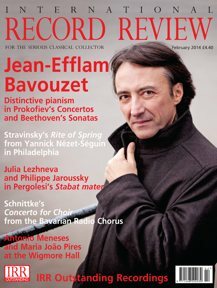 often‑ extraordinarily forward­ looking and harmonically breathtaking, it comes as a real revelation. The absorbing, information‑packed and exquisitely laid‑out booklet, complete with a fine note by Peter Wollny, tells us that the cycle of six Psalms dedicated to the Virgin Mary which Biber composed as part of his considerably more extended Vesperae longiores ac breviores intended to provide music for Vesper services at the Cathedral in Salzburg ‑ Biber had been appointed to the Salzburg court in 1670 as valet and musician, rising to the post of Kapellmeister in 1684 ‑have been, for this recording, combined with four extracts from Kerll's Delectus sacrarum cantionum, originally written while Kerll was Kapellmeister to the Munich court in 1669, to create a small Vespers such as might have been performed in Salzburg during the reign of Archbishop Johann Ernst von Thun. Historically, this may be somewhat speculative, but musically it is utterly convincing, and given these sublime performances from the singers of Cantus Cölln and the instrumentalists of Concerto Palatino under Konrad Junghänel, it is difficult to find any fault either with the programme or the realization of this wonderful if unjustly neglected music. Mustafa Pasha and his followers. At the same time a plague swept the city to which Kerll's wife succumbed, while a large part of the Vienna court orchestra had been killed when they fled Vienna in the face of the invading Ottomans, only to fall directly into their hands. Such complex and confused emotions percolate through the music, not least in the stately 'Kyrie', which, while seeming to pave the way for that magnificent movement which opens Bach's B minor Mass, feels as if it is holding a great outpouring of grief at arm's length. Similarly, the celebratory 'Osanna' seems unwilling to give into any great outpouring of joyousness. Under a veneer of celebration one can, to quote Wollny, hear 'a plethora of exquisite manifestations of double counterpoint [which] curb the exuberant expressivity of the work'. Certainly it receives here a performance of rare commitment and intelligence, , its detail and inner workings brightly illuminated by music‑making of extraordinary intensity. This is, in every way, an outstanding disc.